Well, that's it! I think I've finished sewing all the flowers on my denim garden. I'll leave it for a few days before I get it ready for quilting. When I see it with fresh eyes I'll most likely see things that need tweaking, something added or removed. 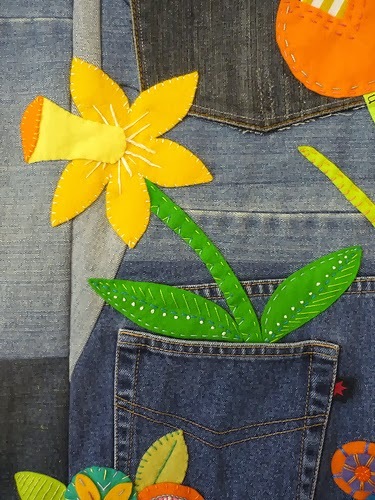 A thought crossed my mind that quilt made with pieced blocks has an obvious finish line, but with applique there's the temptation to add just a little bit more. 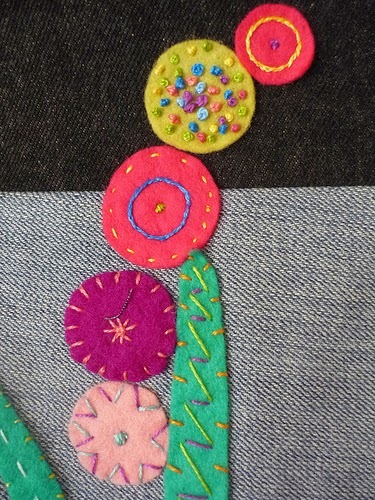 I've really enjoyed creating flowers with shapes and colours and adding personality with perle 8 thread. 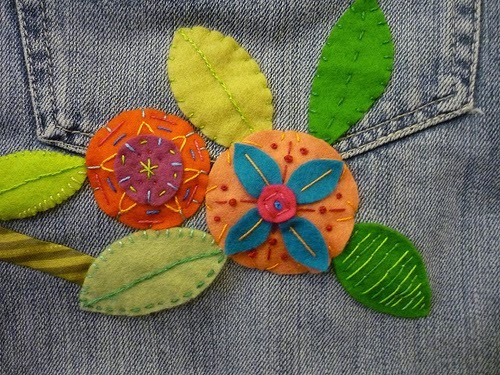 Wool felt is a joy to work with, so easy to cut out a shape and simply sew it in place. Sewing through denim seams was trying at times and the result is imperfect stitches but you know me, I like a bit of wonkiness in my quilts. WOW! What a great quilt! Love the fun, playful flowers! This is a knockout! I love all the stitching detail you've included. And the bright colors make me happy. Fantastic job! Really fabulous….just love the way those colours pop! 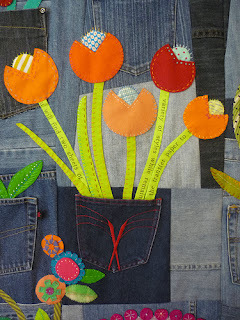 Oh my gosh, Rachael, you are making so beautiful things with denim! This is gorgeous! Love how the flowers grow out of the pockets. I'll have to show this to my mum. She loves things with re-used jeans, too. I am in awe of your magnificence! Just beautiful - I love it! I can't wait to see how you quilt it. Your stitching is AMAZING!! I am in awe (I am just not a stitcher!). It is incredibly gorgeous!! This is so stunning! I just love it! 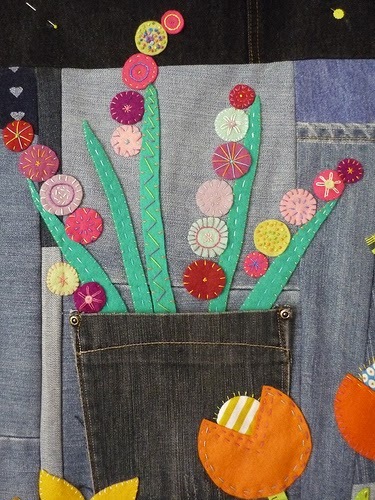 I've never felt any inclination to use denim or felt, but now I suddenly want to make this. exact. quilt. You're inspirational! This is such a stunning quilt. Your creative genius has run wild with this one. 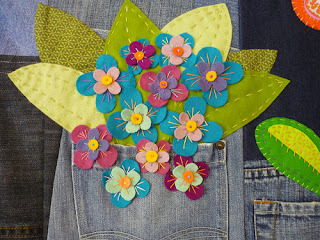 Love the use of the pockets for the flowers. And all the detail in the flowers is gorgeous, too. 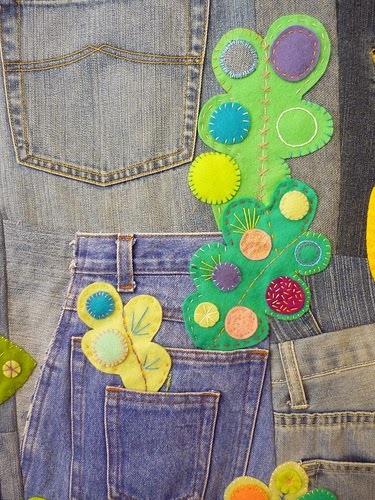 I admire your patience with sewing through the denim. Looking forward to the quilting. so so cool - brilliantly creative - I love it! I agree with Quiltjane, perfectly said. I don't even know what to say! This is absolute fun! Your stitches look amazing. Quilt - One of a kind.. love it! 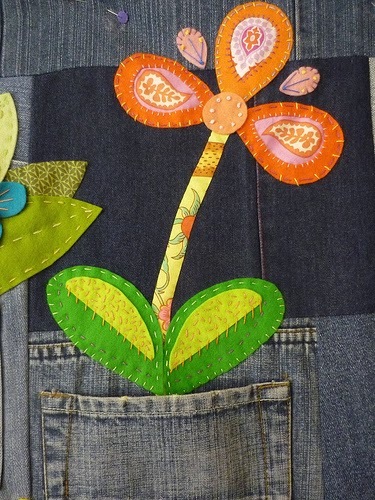 I may never throw away old jeans! This quilt is extraordinary! The love of color shows through and your fabulous imagination just beams. 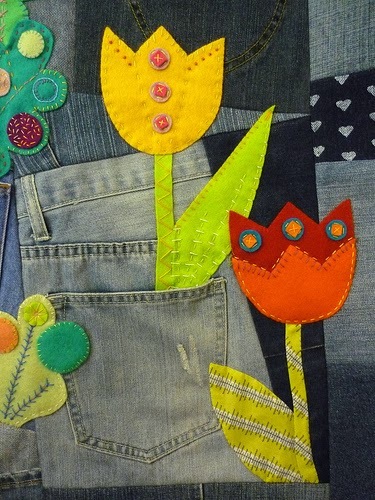 When I look at this quilt I feel happy! WOW!!! What an awesome quilt!!! I just love how you have the flowers coming out of the pockets. So beautiful! I'm in awe of the daffodil especially and love how you used all the pockets! Great work! This is an awesome quilt! It makes me so happy when I look at it :). 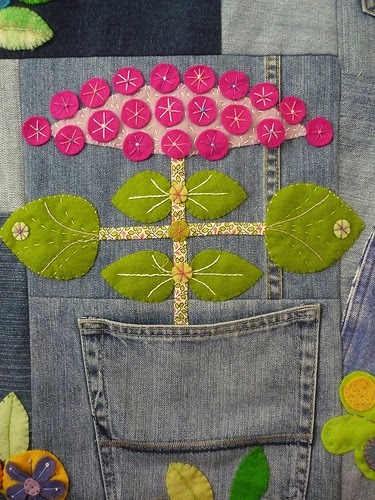 I LOVE the use of pockets! It is a joy! We really see the florist in you. I'm in awe at the things you think up to do ! The detail on the flowers is just wonderful. You have pockets full of posies Rachel! This is so fresh and fun! You've really made something special! I love all your details and little touches. The embroidery is wonderful! Once again.....remarkable and stunning! I could take any one of your pockets and frame it! This is looking just great, Rachael. It's such a good idea! And all the flowers are so cheerful. 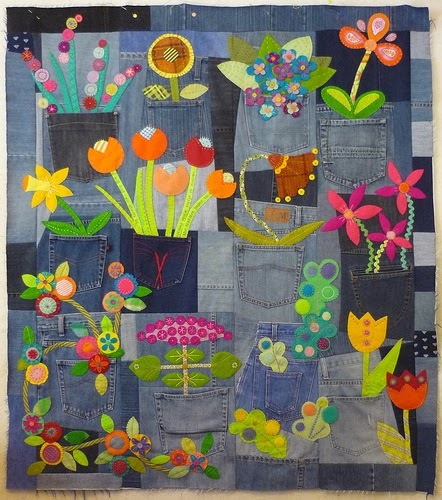 I love all the fun energy in this quilt. Between the color and the flowers in this garden, there's just so much to love and admire. And the wool against denim really, really works. fantastic. I can completely understand just wanting to add more and more. OH MY! It's the happiest piece I've ever seen! 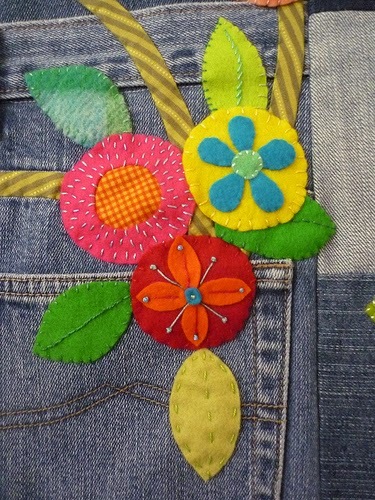 Your felt flowers with embroidery are just exquisite, each one. I love the dimensional quality. Your original idea for this quilt makes my head spin. It is really marvelous!!! This is my brand new favorite!!!!! I LOVE THIS QUILT! Totally fabulous in every way! OH MY GOODNESS! You knocked it out of the park again. This is beautiful and a lot of fun. There really is no end to you surprising me. 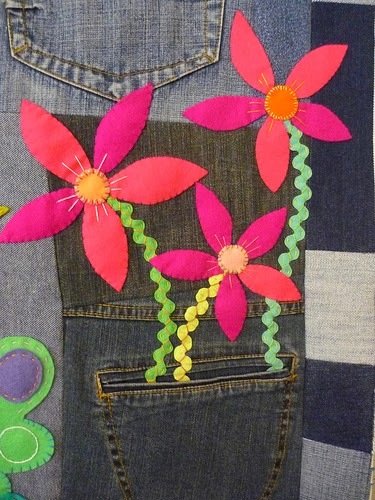 Wow that is stunning, I love the colours against the denim, and the way they are growing out of the pockets! How on earth are you going to quilt it!? FUN!!!! Love it! Happy November! Needed those cheery flowers in the midst of our late cold, bleak fall! Never seen anything soo gorgeous, just love it Rachael!!! Quante belle idee che mi frullano per la testa dopo ave visto questo splendido lavoro!!!!! Just awesome! You have done a wonderful job with your design and colours. Wool is wonderful to work with especially because of the no-fray thing. A florist's hand at work. The bouquets' are a splendid result of your talents. You're so right about denim being hard to work with at times. It is heavy and bulky. I commend you if you can do hand quilting on it. The one I made for my youngest daughter was a log cabin and I had it professionally quilted. 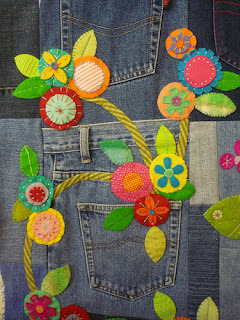 The gal who quilted it used a variegated red, white and blue quilting thread. The center if each block was a red fabric with white stars. The seams were so bulky and pressing them open to reduce on the thickness was hard too, but it all worked out in the end. I just love what you did with the flowers. It made it all pop right out and made it a "Happy" quilt. It is full of whimsey and wonderful colors. Definitely a one of a kind creation. This looks like one of those marvelously fertile vertical gardens in an organic nirvana. It is beautiful. The combination of wool felt and denim cotton feels solid and right. The embroidery adds just the right amount of lightness and detail. It is quite a feat to have balanced all those strongly characters fabrics within such a vibrant subject. You Queen of such feats. LOVE this so very, very much!!!! Rachael your flowers are wonderful. Its such a fun quilt. Just makes you smile. I just love your denim garden, so bright and cheerful, though I can't wait to see how you quilt it!! Oh, my! 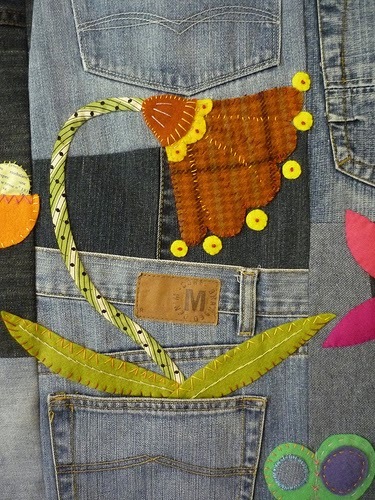 This is just fabulous :D The most unique jeans quilt I've seen. I have thoroughly enjoyed the walk through the garden Rachael...what fun! This has got to be one of the most fabulous quilts I have ever seen! Wow!!!! Thank you for your inspiration! Oh it's absolutely fabulous, love it! This is amazing Rachael! So colorful and very Rachaeldaisy! I love working with felt too...it is fun not to have to finish edges! Gorgeous! So ingenious and full of life..
Congratulations Rachel, that is entirely wonderful news!